Orange County Beekeepers Association’s 2018 Bee School started January 16th. Once again the class was fully enrolled with 75 new and prospective beekeepers, including OCBA’s two apprentices, Catherine Trusky and Megan Talikoff. Randall Austin, OCBA’s Director of Education welcomed the new beekeepers and walked them through an overview of beekeeping as he introduced them to the syllabus for the 10 week session. This year’s class boasts a number of friends/family members of existing OCBA beekeepers, as well as a higher than usual number of students who are taking the class with a spouse, partner or other family member. 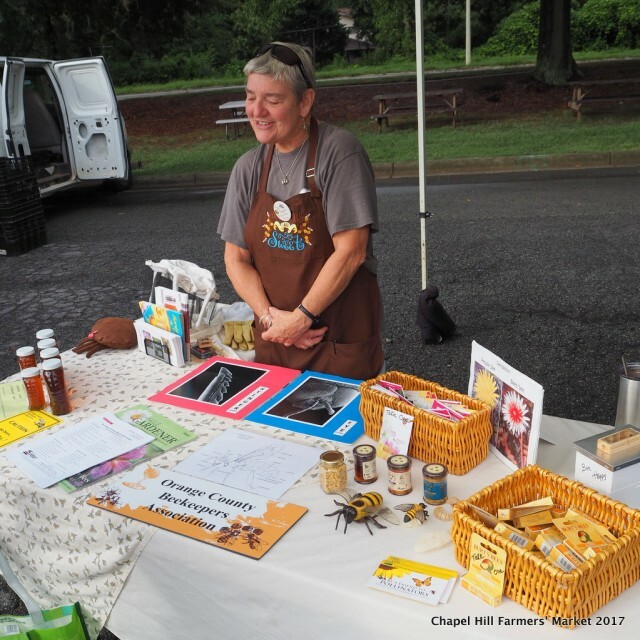 OCBA kicked off National Honey Bee Week at the Chapel Hill Farmers Market. Vendors were asked to help promote the role of honey bees and other pollinators by displaying signs highlighting the role of bees in the production of their produce. Chris Apple helped the non-beekeeping public appreciate the role of honey bees in the pollination of the world’s food supply. She staffed an information table about bees, beekeeping and honey production. Gifts of lip balm donated by Burt’s Bees and wild flower seed packets donated by BayerCropScience were available to market patrons who stopped by the info table. Chris Apple offers information about beekeeping at the market. Next Saturday on National Honey Bee Day, OCBA beekeepers will repeat this community education and outreach effort at the Eno River Farmers’ Market in Hillsborough. More photos from the Chapel Hill Farmers’ Market event. OCBA was well represented at the 100th Anniversary NC State Beekeepers Association Conference in Winston-Salem in July – at least 27 of OCBA members attended. That may be a record for OCBA attendance. The conference itself also set an attendance record with 813 of the association’s 4,456 members attending. NCSBA is far and away the largest beekeeping organization in the U.S.
Cynthia Speed’s honey bee quilt was the highlight of the silent auction. Conference participants bought raffle tickets in the hope of winning the quilt as the grand prize. NCSU’s apiculture lab got a significant financial boost from Cynthia’s efforts. The beautiful quilt garnered $760 in raffle proceeds and her soft sculpture varroa mite earned $30 in the silent auction. To honor NCSBA’s 100 years of service to beekeepers OCBA provided 100 unique, native pollinator plants for display and sale. These plants were nursed through the heat of summer by Chris Apple, Celeste Mayer, Lisa Vogel, Karen Lauterbach, Amber Tarter, Mary Leonhardi and Jeanne Arnts. The plants were displayed in the main conference hall for to see – and buy. This plant sale raised an additional $262 for Dr. Tarpy’s apiculture program at NCSU. 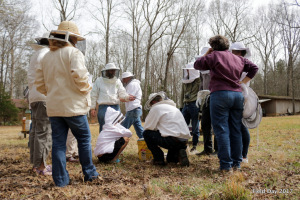 All told, OCBA’s dedicated volunteers generated over $1,000 to support apiculture research in North Carolina. 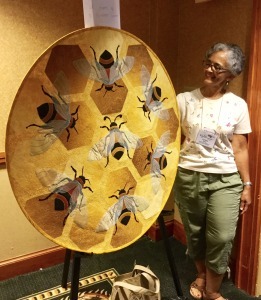 In the prize categories, two OCBA Beekeepers walked away with top honors. Mark Powers won top prize in the photography category. Randall Austin received top prize in the mead category and third prize in the melomel category. The revival of Bee Quiz Bowl was both educational and fun. 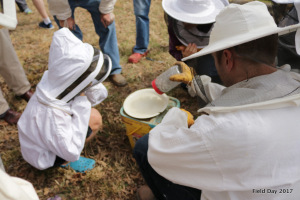 The Bee Bowl provided a great opportunity to learn some of the finer points of beekeeping and to showcase the deep talents of NC’s beekeepers in a fun format. There are a lot of talented beekeepers in this state! Even though OCBA didn’t take home the Bee Bowl trophy, it was well worth the effort. Our Bee Bowl Team of Randall Austin, Lewis Cauble and Jeff Lee represented us well. 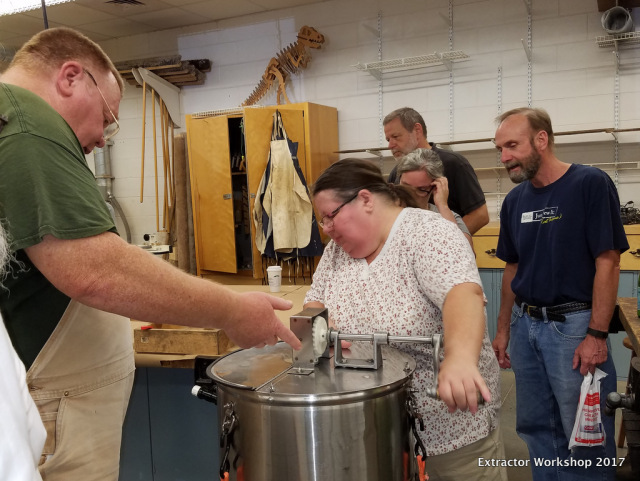 Check out the Extractor Workday Photos! Saturday, March 25th, Randall Austin graciously hosted an OCBA Field Day at his apiary. 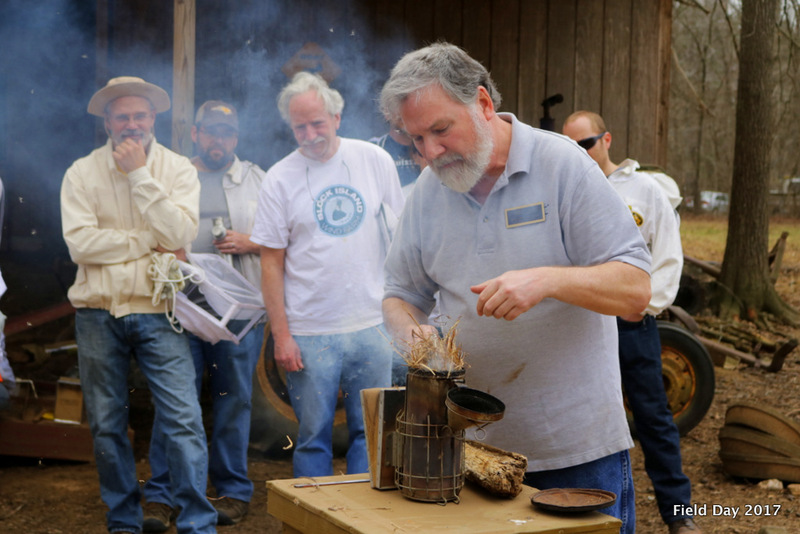 Recent graduates of OCBA’s Bee School learned how to light a smoker, inspect a hive, and do a sugar shake to evaluate the Varroa mite load in their colonies. 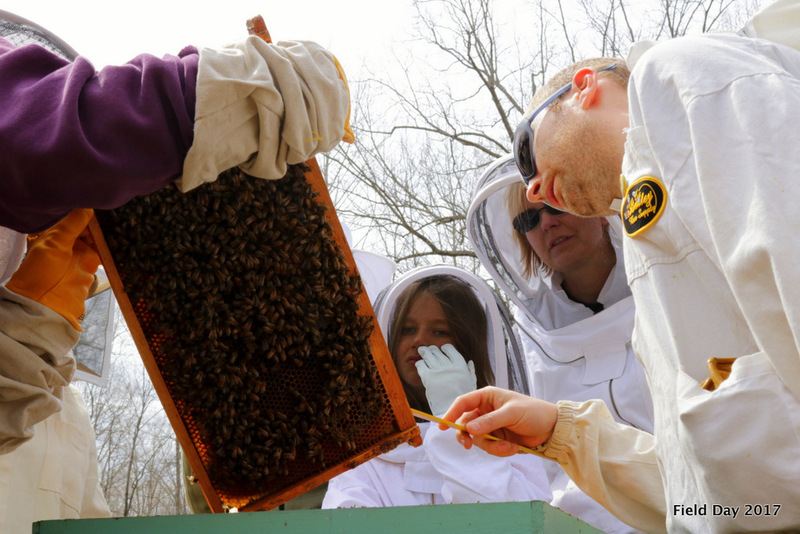 The Field Day offerred many new beekeepers their first look inside an active hive. As always, Randall’s bees were ‘honeys’ and remained calm and composed throughout.